Joustmites (カブリムシ?, lit. 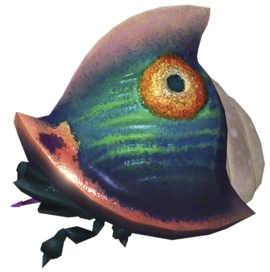 : "Head Insect") are enemies that were first introduced in Pikmin 3. They behave similarly to the Cloaking Burrow-nit, and look like them as well. They can be seen as an opposite of the Burrow-nit however, as Joustmites shields the front of their body, requiring the Pikmin to attack from behind. It is unconfirmed if the two species are related or part of the same family, though it can be assumed that they are. Flying variants, known as Flighty Joustmites, also appear in Pikmin 3. A Joustmite stabbing two unfortunate Pikmin. Just like the Cloaking Burrow-nit, the Joustmite hides partially buried in the ground, waiting for unsuspecting prey. Once a group of Pikmin enters the attack range of the enemy, it pops out from under the ground and proceeds to attack the player's Pikmin by attempting to use its long, needle-like proboscis to spear them. If any Pikmin are caught in this attack, they will be held in the air for a brief moment before being eaten. Unlike the Burrow-nit, the Joustmite can capture up to 3 Pikmin with this attack. It should be noted that Rock Pikmin are immune to its stabbing attacks. The Joustmite can also shake off Pikmin, which also shakes its loose carapace. The enemy is rather slow-moving, making it easy to walk around and attack from behind. An almost defeated Joustmite being scanned. As mentioned before, the Joustmite protects the front of its body, making it completely immune to frontal assaults. The most effective strategy is to approach it from behind without waking it up, and proceeding to swarm the creature. If the Joustmite is awake, you can still try to run behind it and proceed to throw Pikmin, or you can run away, and the Joustmite will go back underground. Rock Pikmin are immune to its attacks, making throwing them at the Joustmite's rear another effective strategy. The enemy eats Pikmin at a rather fast rate, so be aware. "Joustmite" is a combination of two words. "Joust" (or "jousting") is a medieval sport where two opponents riding on horses try to knock the other one off with a sharp lance, and refers to the Joustmite's sharp proboscis. A "mite" is an insect. In Japan, its name is カブリムシ?, which translates to "Head Insect", and likely refers to how the bug looks like one large head, because of its shell. Its internal name consists of only the first word of its Japanese name, kaburi (head). A Joustmite buried in the ground. A Joustmite in the Distant Tundra area. Rock Pikmin fight a Joustmite. A frontal view of the Joustmite. A side view of a wandering Joustmite. The data file on the Joustmite. Unlike the Cloaking Burrow-nit, the Joustmite's death and shaking animations show that its shell is unattached to its body, making it more of a helmet than an actual shell. This page was last edited on April 14, 2019, at 20:41.